Robot Mode: First off, Prime Bulkhead suffers from the same problem that plagued Animated Voyager Bulkhead. Meaning that, as a Voyager-class robot, he’s not nearly tall enough. He’s not as miniscule when compared to his Deluxe-class comrades as he was in Animated, but still, Bulkhead should really be Ultra- or Leader-class in order to be in proper scale with the others. That’s just about the only bad thing I can say about Bulkhead, though. Because what we have here is a massive, amazingly strong looking robot that is almost a spitting image to the character we’re seeing in the Prime TV series. The chest assembly isn’t quite as smooth as it looks on the screen, but everything fits together very well and despite the slight puzzle-look, everything locks together just fine and holds steady, no problems. Same goes for the rest of Bulkhead’s body, there are no loose parts flapping around. The only slight drawback are the wheels on the back, which stick out a bit much for my taste, but other than that: no complaints. Just be aware, though: Bulkhead as he comes in the package is seriously mistransformed (he wouldn't have fit otherwise). The chest and back need to be put together properly before displaying him. Articulation is pretty neat, too. Bulkhead will never be a contortionist due to his proportions, especially the short, stubby legs, but he’s got all the joints he needs, especially in the arms. Just about the only thing missing are twisting wrists, but he gets by without them. The head can turn fully, too, though the detailing on his neck gets in the way a bit, so he can’t look fully sideways. One thing I’m a bit weary of is the fact that his upper arms might potentially scratch the sides of his torso, as there is no space there when you move the arms forward or backwards. No scratches yet, but keep an eye on that part. Finally, weapons. Bulkhead comes with his trusty mace, somewhat similar to the wrecking ball he had in Animated, which he can fit onto either wrist. Simply flip in the hand, which reveals a hole where you can peg it in. Alternatively you can imagine the hole to be the muzzle of Bulkhead’s energy weapon. Okay, doesn’t really look like the gun he can transform his hand into in the series, but it’s better than nothing. The mace looks pretty cool and Bulkhead can swing it nicely thanks to his very good arm articulation. Oh, and he can also hold it in his hand if you want, but that’s hardly screen accurate, so I didn’t take a picture of it. Bottom line: no real complaints about the robot mode except that it should be bigger. Oh, and this being the Japanese version, it’s a slightly darker green than the US release, but that’s the only real difference. Vehicle Mode: Amazingly enough the rather massive Bulkhead folds together into a very compact, almost tiny-looking SUV. Don’t get me wrong, the car is still quite a bit bigger than the vehicle modes of Bulkhead’s Deluxe-sized comrades, but in direct comparison to his robot mode, it seems tiny. The transformation itself is pretty straightforward without any difficult spots. The car itself looks realistic enough, though I don’t think it’s supposed to be any specific model. There is a bit too much stuff hanging on the underside of the car, very close to the ground, but none of it is recognizable as robot parts. Little side note: the holes where Bulkhead can plug in his mace in robot mode, which can double as energy weapons, serve yet another function here, as they turn into his exhausts. The mace, meanwhile, can be stored on the back of the car, though it does look pretty out of place there. Still, at least they did include somewhere to put it. Well, not much more I can write here. It’s a car, nicely detailed, no gimmicks needed. No serious complaints. Remarks: When it came to deciding on the „Big Guy“ for the Prime TV series’ five-man-band, the powers that be decided on Ironhide (probably a Movie-inspired version). But when they were finished designing his look, they realized that they had actually recreated Animated Bulkhead. So good bye Ironhide, hello Bulkhead. Bulkhead’s been in pretty much every Prime episode so far and does a very good job as the loveable strong guy, though he’s neither as scientifically brilliant nor as comically clumsy as Animated Bulkhead was. His interaction with Arcee and the other characters is very good, though, and I love the big guy as much as I did in Animated. Getting your hand on a First Edition Voyager Bulkhead was not an easy task. Originally slated for wide-spread release, Bulky was cancelled in most of the US and didn’t see much distribution elsewhere, either. The Japanese version, which I have here, was actually easier to get for most Europeans than anything released (or not) in the US. There will be another Voyager Bulkhead (or Powerizer, rather) in the main Prime toyline (subtitled Robots in Disguise). 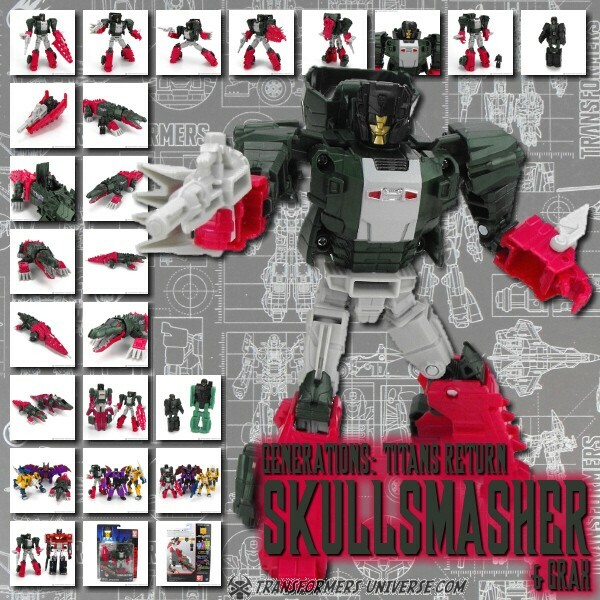 Keeping in mind that I’ve only seen pictures of this later Bulkhead toy, though, I recommend getting this one here, even at the higher price point. He’s cool, he’s very screen accurate, and he’s just pure Bulkhead. What’s not to like except the fact that he should be bigger still? Update 2012-03-13: I've been informed that I didn't quite finish the chest transformation of Bulkhead, as the headlights of the car mode are supposed to slide up a bit so they peek out from underneath the door windows. So here's how that looks like. Plus, Bulky made a new friend on our living room table.